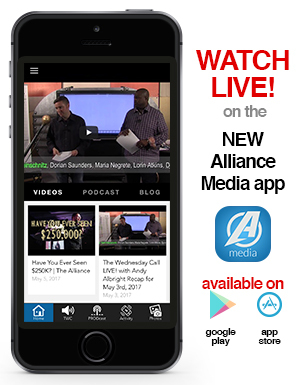 Andy Albright's weekly live show is specifically designed for agents in The Alliance who want to improve their business, themselves, and their life. Each week, highlights of the company's top leaders are featured for their diligent work and leadership among the company. Albright often reveals the latest company news, sales secrets, and key topics on the weekly show. As President & CEO of National Agents Alliance, Andy Albright is dedicated to investing his time to ensure that the direction of National Agents Alliance and all it's team members align. The Wednesday Call allows Andy the opportunity to be hands on in his approach. The live shows are also filmed before a studio audience that Albright interacts with. Through these interactions, you will learn the stories of your fellow National Agents Alliance team members, gain feedback from them, and Andy has the opporutnity to answer their questions directly. And what better way to stay in tune with the heartbeat of The Alliance than to hear directly from its Founder, President & CEO, Andy Albright? Along with his weekly special guests, Andy also demonstrates principles of business success to agents of The Alliance. Anyone interested in starting a successful and lucrative business, regardless of industry, will find the enthusiasm of The Alliance's leader infectious and his lessons invaluable. If you want to find out more on how to Have Fun, Make Money, and Make a Difference in others lives, be sure to tune in to NAAtv every Wednesday at 12:30PM Eastern Time. Not an agent with The Alliance? That's no problem! check out our Visit our site if you would like more information or SIGN UP if you are ready to get started now!